September is National Breakfast Month, so I thought it would be fun to look at what’s popular now in terms of breakfast recipes. Here’s a collection of four of the most popular books currently available on Amazon, according to their sales ranks and numbers of customer reviews. These books represent definite trends in what consumers are looking for in terms of food and nutrition. And the recipes inside prove that food is more than just something to use as entertainment or emotional comfort. Food can actually be used as medicine. So why not start your day off right by picking out one (or more) of the recipes in one of these books and see how much better you feel for the whole rest of the day. Lisa Lillien, otherwise known as the “Hungry Girl,” is the author of 12 cookbooks. Her recipes focus on healthy eating, for the most part, especially in terms of cutting out calories and fat (and who doesn’t want more recipes that do that?). That’s where this book, published in 2011, comes in. It has 300 recipes in it, each of which results in a meal containing 300 calories or less. While this book does have other recipes in it besides breakfast recipes, the breakfast section is substantial – with over 60 recipes focusing on the very first meal of the day, including microwave egg mugs, oatmeal, and muffins! 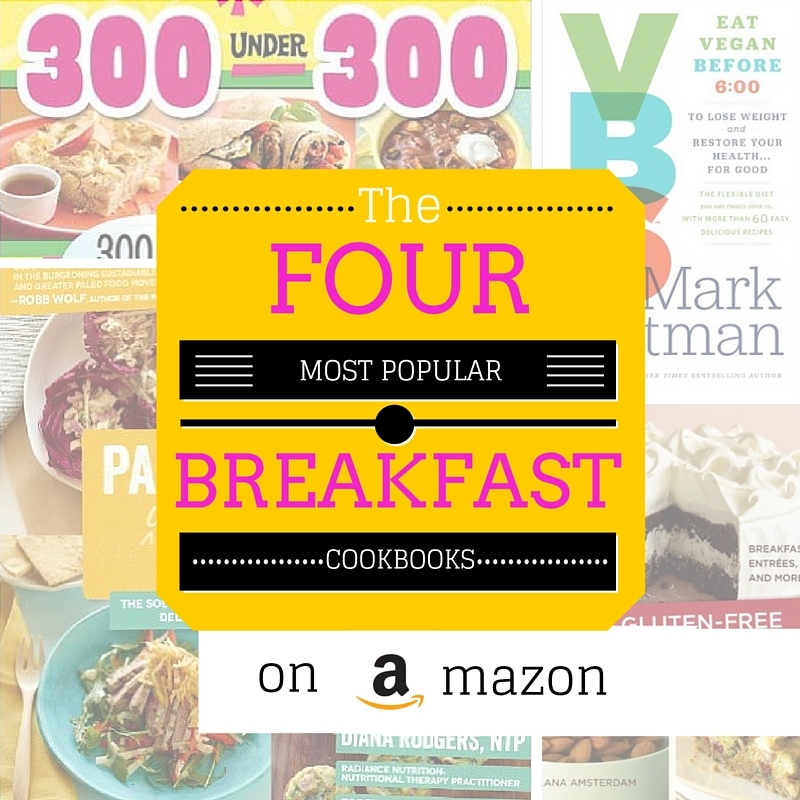 The next most popular breakfast cookbook on Amazon focuses on a very specific problem – that of gluten intolerance. This is not an issue I’ve had to deal with personally, and thankfully no one in my family has an issue with this, but millions of people all over the world do, so there’s a very real need for recipe books like this one. It contains 99 recipes that (as is the case with the Hungry Girl book) include more than just breakfast dishes, but it does have some fabulous gluten-free breakfast variations on some favorites, including pancakes (and you know how I love pancakes!). The premise of this next book, and its companion cookbook, intrigued me so much I decided to check it out for myself. I’ll have my own copy soon (so look for vegan-inspired recipes here in the future), but for now you can click on the links and check the book out for yourself. All indications (from the Bible) are that man was created to be vegan (or at least vegetarian), but that all changed after The Flood (if not before). I love the idea of getting the body back to its original state by giving it a natural vegan diet. And I love the idea of not completely depriving or limiting yourself from enjoying the foods that you love because the Bible also indicates that there’s nothing wrong with eating meat or animal-derived products. Will I lose a ton of weight? I doubt it. But I do think I’ll learn some important things about my body and how it reacts to certain foods. And I might just grow spiritually from it, as well. For the past couple of years, all I’ve heard about is this idea of the paleo diet (which sounds pretty similar to a low carbohydrate diet, if you ask me, but I’m sure there are some differences). I’ve not hopped on the paleo diet bandwagon, but some of my friends have…and so have plenty of other people, apparently, judging by the popularity of some of the paleo diet books. I thought this one was especially neat because not only does it concentrate on paleo eating but it also narrows it down to diet-related food you can eat on the run (and most everyone is always on the run, these days). Unlike the other books on this list, this one focuses on only two meals – breakfast and lunch – but there are 100 recipes in here that are 100% portable. No wonder this book is popular! I hope this post has given you some ideas for making the most important meal of the day more enjoyable and healthier…and you don’t even have an excuse for missing breakfast with all the on-the-go options. Have a wonderful, delicious National Breakfast Month!